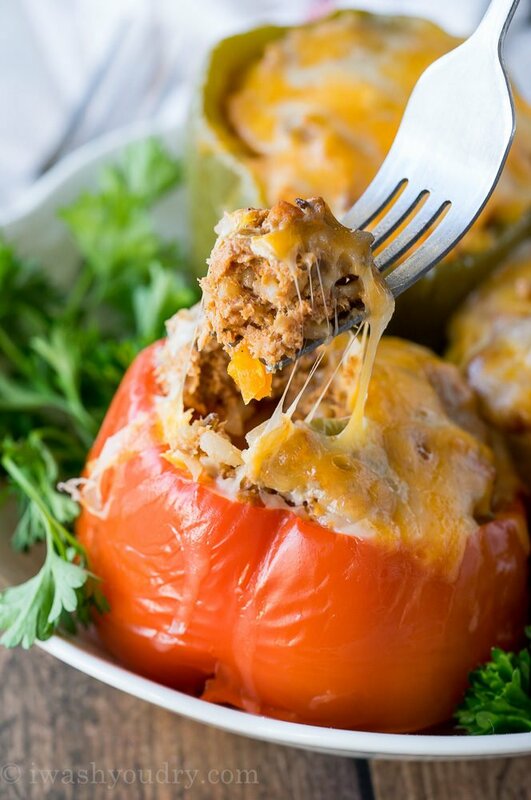 I’m so excited to share these Slow Cooker Steakhouse Stuffed Peppers with you today! There is nothing better than an easy, comforting dinner, that’s literally prepared in just a few minutes, but also hot and ready when you get home from work. Can I get an Amen?! I know we’re all so super busy this time of year, and sometimes dinner gets the last thought. I can’t tell you how many times I’ve been working all day, helping kids with homework and projects, running errands and then WHAM! It’s dinner time and I’m at a loss. When that happens I usually turn to my one skillet dinners, or just grab some pizza and call it a night. 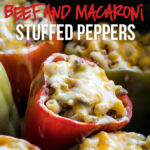 But if you’re wanting an even less stress dinner, these peppers are where it’s at. 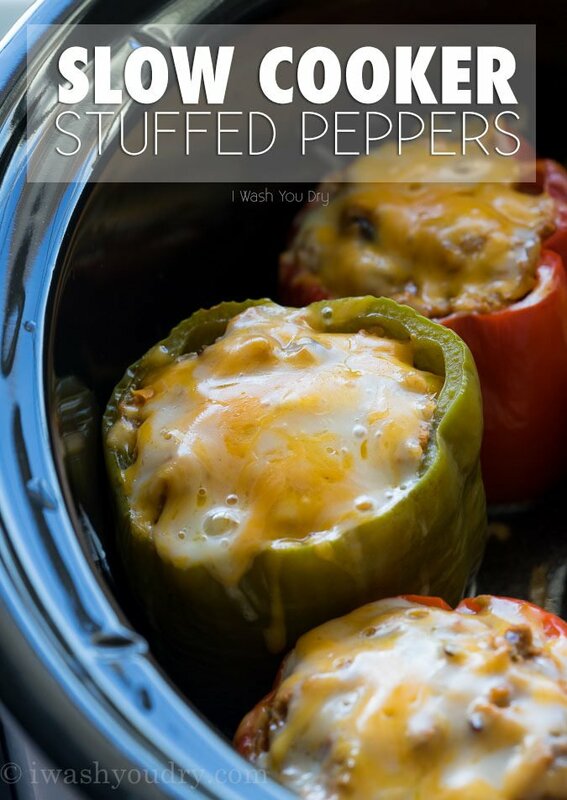 Just lop off the tops of each pepper, (don’t forget to save the tops to dice up) and stuff with this delicious steakhouse inspired filling. 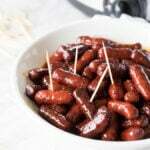 Place them in the slow cooker and off you go on your busy day. Let me stop right here and explain something about this rice. You can use any leftover rice that you might have. But sometimes you just don’t have any rice in the fridge, so I used a package of Uncle Ben’s microwavable rice. Um.. brilliant time saver. Just toss the rice right in with the ground beef mixture and you’re done. 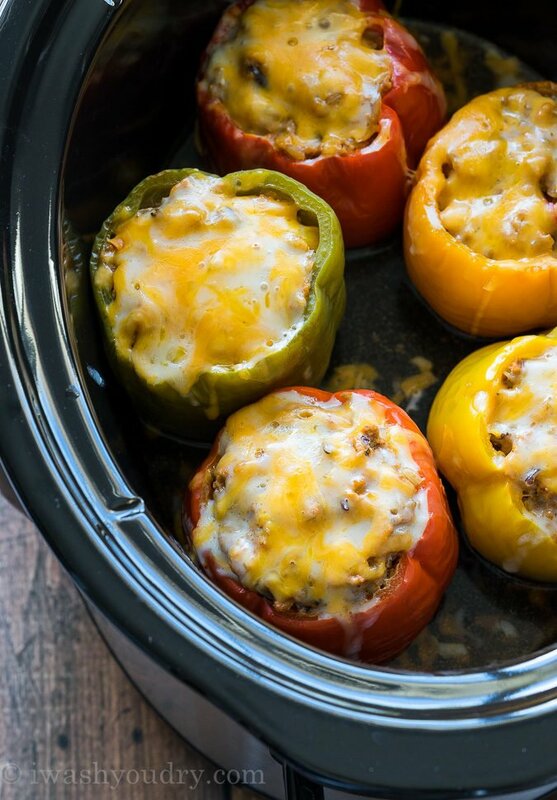 Stuff the peppers with the meat and rice mixture, then let them go in the slow cooker. Right before serving top with some shredded cheese and cover. The cheese will melt in seconds and then they are ready to enjoy! A complete dinner even the pickiest of eaters can get behind. I should know, my picky eater gave this dinner two thumbs up! Cut the tops of the peppers off and discard the seeds and stems, but save the pepper portion of the tops and dice. Reserve 1/2 cup for the filling. Combine the diced peppers, ground beef, onion, steak sauce, tomato sauce and rice in a large bowl and stir to combine. Season with salt and pepper to taste. Stuff each pepper with the ground beef mixture and place in the crock pot. Pour about 1/4 cup of water into the bottom of the crock pot and cover. Cook on low 6 to 8 hours or HIGH for 4 hours. Just before serving top with the shredded cheese and cover until melted. Enjoy! The bottom of the slow cooker will have quite a bit of water after cooking from the peppers releasing their water. Use a slotted spoon to pick up the peppers and let drain before plating. DON’T FORGET TO PIN THIS RECIPE TO SAVE IT! So I’m not using instant rice, so I need to cook it before or can I put it in not cooked? 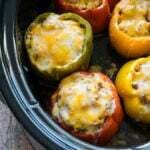 What temp and how long would these need to be cooked in the oven if not using a slow cooker? Nevermind. Just saw someone else asked. Sorry to repeat. Can I use a different type of steak sauce or does it have to be A1? I know this is for slow cooker and I planned to make it in my crockpot. But today time is getting to me. Do you have the recipe or just the time and temp to make this in the oven even? Thank you! When you used the Uncle Ben’s rice, did microwaved it before or threw it in rww? I micro-waved it first, so it was fully cooked. Can you use coucus instead of brown rice ? Yes! That’s a great substitution! Can it stay in the crockpot on warm for about 3 hr after it does the 8 hr cook? I’m asking because I work a 10hr shift. Also can you prefer make them the night before and place them in the fridge until cooking the next morning? Hi Ashlee, You can definitely prep them the night before and place them in the crock pot in the morning. Cook them on low for the 8 hours and then let it switch over to warm and you should be good. 🙂 Enjoy! I work a 10 hr shift everyday. Was planning on making these so just have a few questions. 1 . Can I prepare them the night before and place them in the crackpot the next morning? 2. Also since I work a 10 to 11 hour shift if I have them on the 8 hr setting my crockpot already goes to warm…will they be okay in the crockpot on warm for about 3hr until I get home? Tried this and was really good! All I changed was added cheese to the mixture as well as on top because we love our cheese. Will definitely make again! As a side note, at the four hour mark the peppers were perfect. I cooked an additional hour because I had a visitor and in that time frame I made the peppers a bit soggy. So make sure to watch it when close!! Thanks for the recipe! Do you cook the ground beef before adding it to the mix, or does it go in raw? Oh, I see someone else has already asked this, sorry to repeat!! 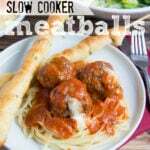 The ground beef goes in raw, and gets cooked in the slow cooker. If you prefer, you can brown the beef before hand, but it’s not necessary. Thanks! I had this same question! 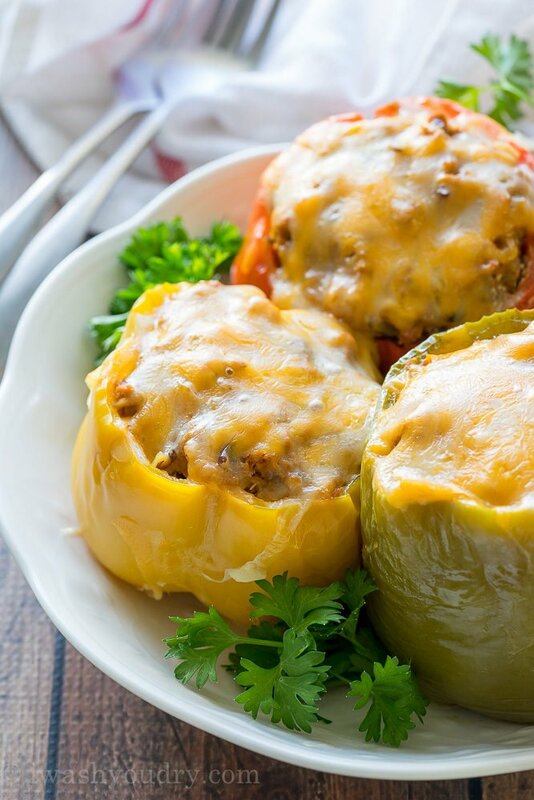 Can you please confirm that the ground beef is not cooked before stuffing the peppers? It gets mixed with the other ingredients raw? Do you cook the ground beef before applying to the mixture? I’d like to know too! Just threw in the crock pot and I browned the beef with peppers and onions before throwing in with the rest of ingredients and stuffing the peppers. Hoping this was right and they turn out good!